Funny title, but I just had to share how Frontier sent me a wonderful mailer that promised either a $100 Apple Gift Card just to renew my existing service, or a $150 Apple Gift Card to add a new service. I phoned the 888 number and was connected with a service representative that first asked for my 10 digit account number on my monthly paper bill. I told her that I don’t receive a paper bill because I opted into their paper-free program. I provided her my name, phone numbers, and address, but none of that was sufficient to appease her. I looked at my Quicken record where it shows the monthly payment to Frontier, however there was no account number listed. 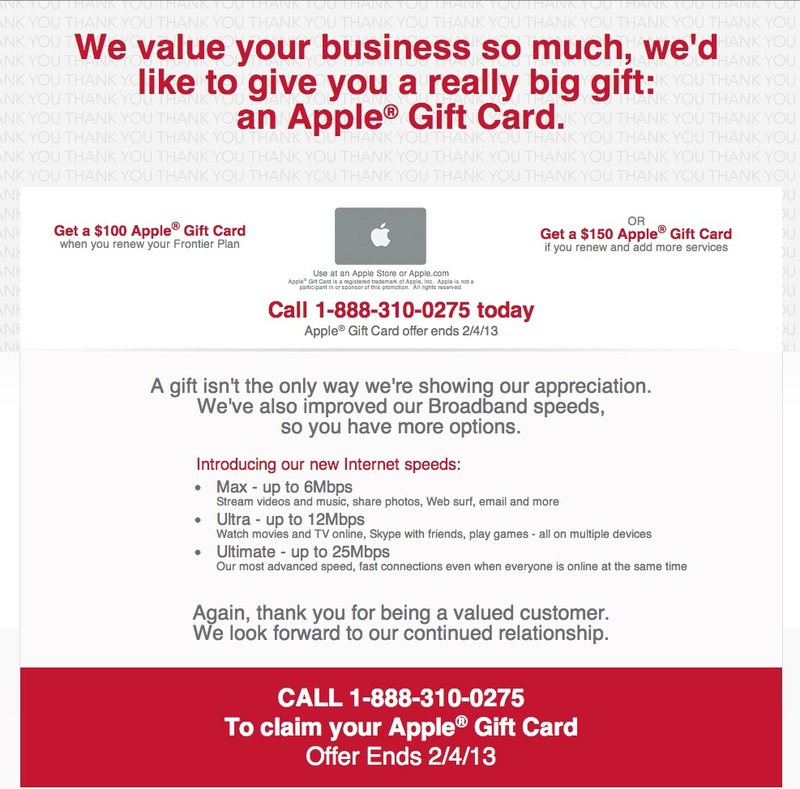 Finally, she explained that to qualify for the $100 Apple Gift Card required that I have two or more Frontier services, however I only have one service – FIOS for Internet. I had no intention of adding a second service, so the call ended with me receiving no Apple Gift Card. I think that loyalty rewards are wonderful, just not from Frontier. Just the information I was looking for before making the phone call. Thank you for the insight into this bait and switch scheme. These people are total liars. The rep on the phone said I had to renew for 2 years my contract at $39.99 a month. I was promised that maintaining my current account would cause them to kick back a $100 Apple gift card. Not only did they cancel my account, they upped me to a service I did not ask for. They refuse to deal with it. They are a scam. Don’t do this … go elsewhere. I agree, Frontier’s actions are imoral and probably illegal. Why is our Attorney General not taking action here? Bait and switch. Given a different reason why their promo was not applicable to me each time I called. Filed a BBB complaint against the company. 3rd rep finally said it was all their errors (one after another after another after another) and said she could fix the problem. More problem than it was worth, and had to fight to get $100 in bogus charges cleared. Just happened to me. I signed up in January and was told by agents that I would get the Apple gift card in 3-5 weeks. When I called to find out why the card hadn’t arrived, the agent told me it only applied to internet service, and since I didn’t upgrade my internet, I didn’t qualify. This was expedited and I was then told I needed to upgrade all my services which was clearly not the case when they described the offer, accepted my renewal and told me that the gift card would be received in 3-5 weeks. Dan, Frontier is plainly being deceptive and they should be punished for it. I had a similar experience . The promo flyer clearly states renew existing plan for $100 gift card. They switched me to a more expensive monthly plan that I stated several times that I did not want. After many calls ( with supervisor to call within 48 hours that didn’t happen)I gave up. Clearly bait and switch! Very unhappy with Frontier. Sorry to hear about your bait-and-switch experience with Frontier. I like the fast FIOS, just not their deceptive ads. I also had a similar experience with the Frontier 2 year renewal Apple gift card scam. I even opted in to upgrade my service to receive the $150 gift card, and the telephone representative told me what I needed to do to qualify. After receiving the upgrade, three weeks went by and no gift card. I called Frontier and apparently the rep I had spoken to previously was in the wrong for telling me I would receive the gift card. Something here does seems illegal. I wonder has anyone gotten an Apple gift card through Frontier? Brett, way to go! That was a lot of effort on your part, but victory is sweet all the same. I had the exact same thing happen to me. Our internet has been dreadfully slow for a year, so when we seen this promotion we decided it was time to upgrade. They told us we could get 25 bps, so we had a tech come out to do the upgrade. On the frontier check your speed web site it said we were getting 18 bps, which was fine, because anything was better than what we were getting. Well the tech left and we started using the Internet with new modem, but it was the same as before. Sluggish and slow! I called after a few days and demanded to know why it was so slow when we had upgraded and signed a new contract. I was then informed by a customer service rep that we cannot even get more than 3 bps where we live! They couldn’t tell me why when the tech checked the speed verification web site it said we were getting 18! So customers beware you may not be getting the speeds that you are paying for or what they are telling you on that site! As far as the gift card goes, we have called and called and have been told since dec./jan. that it would be here in a few weeks. Now it is April and they are saying we do not qualify for it! Here’s the big picture, we are now stuck in contract with them at a higher rate and no gift card! I cannot wait until we have another choice in providers out here! Also if you call to complain, and the automated system tells you for faster service enter your phone number, DO NOT! They will never answer. This company is a scam. And they are using a well respected company to scam people. Sorry to hear about how Frontier did the old bait-and-switch with you on slow speeds and high prices. I’m dealing with this headache right now. I signed up and said receive the card in 3 to 5 weeks. Call 2.5 months later and was told I wasn’t eligible for it regardless of what the original rep said when I renewed. Was told that I needed to buy their internet security suite in order to qualify for the card. When asked what was the penalty for getting out my contract since I renewed due to false advertising, I was told it would cost me $200. I’ve filed with the BBB website and the Oregon DOJ with the link provided above. Anybody have any suggestions on who else to file with to get these SOBS to cough up what they owe??? I hate corporate bullies that think they can push consumers around when they know the mistake is completely their fault! I’m stubborn like that and I won’t quit until I get what I was promised. Folks, this story now has a happy ending. Yesterday I spoke by phone with Frank Lackey, Compliance Specialist with the Oregon Public Utility Commission, and he confronted Frontier Communications about their bait and switch campaign, so I am getting a $100.00 credit to my account. Who knew that we had an advocate called the Oregon Public Utility Commission? Hey good luck everyone with the infamous frontier scam but if you are looking for a way out of your contract you can call them and tell them you are moving and as long as you are “moving” into an area that their service does not cover all you have to pay is a 50 dollar charge. Of course I am not saying to “lie” to them like they did, but whatever.. Good luck!! Keep calling them back. We have FIOS only and they said we qualified for it. I have now called them back three times, each time they said it should arrive any day in the next two weeks. I’ve been calling since January, and my last call was just today. I still haven’t received it. Maybe third time’s a charm. We’ve been waiting for months for the promised gift card and, after three calls, have been told the most ridiculous excuses as to why we have not received our card. The last one was priceless: the rep told my wife that it was sent, after several weeks of delay, via UPS insured and to expect it in 3 weeks. How strange to send a simple card via a package-delivering service which, normally, only takes 7 to 10 days max for its lowest cost delivery. I didn’t believe this for a minute and, sure enough, we are now coming up on three weeks and no card. How sad! Frontier FIOS is a good product for which to contract. There’s absolutely no reason to resort to these kinds of tricks and lies to get people on board. We are thoroughly disgusted and have contacted Oregon Public Utility Commission and will also follow up with our Attorney General’s Office. Stick with it. I agree that Frontier has stooped quite low to treat loyal customers so badly. I went thru this same ordeal back in 2013, with excuses after excuses, wait 3 weeks, wait 3 weeks,, I wrote down every Reps name for my records,,THEN I reported it to the BBB,That was at about 3-4 months of waiting.. They contacted Frontier, that got results. As I was threatening to go to my Attorney General. I got my card in 7 days,thru carrier then… I think Frontier just wants you to give up… NOT ME!!! Carol, way to go on being persistent.